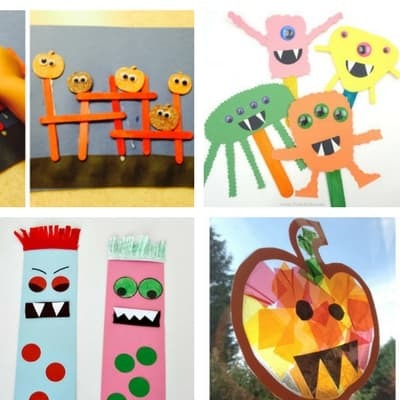 We can’t get enough of these Halloween crafts for toddlers at the moment! 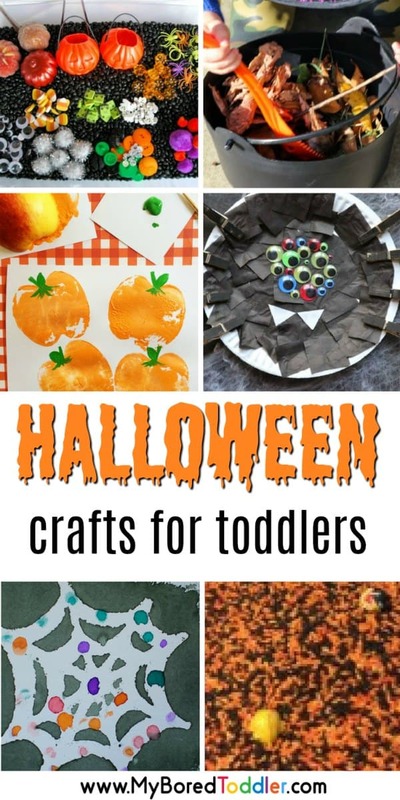 Halloween is such a fun time and we’ve made it even better with this collection of Halloween crafts that are perfect for 1, 2 and 3 year olds. 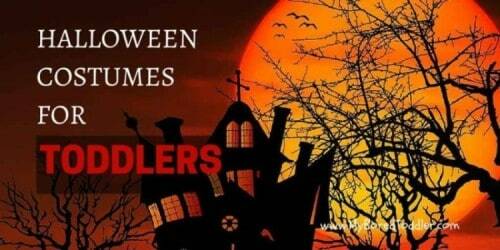 Halloween is such a lot of fun, and there’s no reason your toddler should miss out on the action. 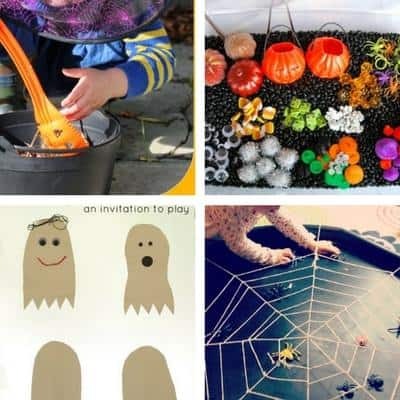 We’ve rounded up some of the best Halloween crafts and activities for toddlers. 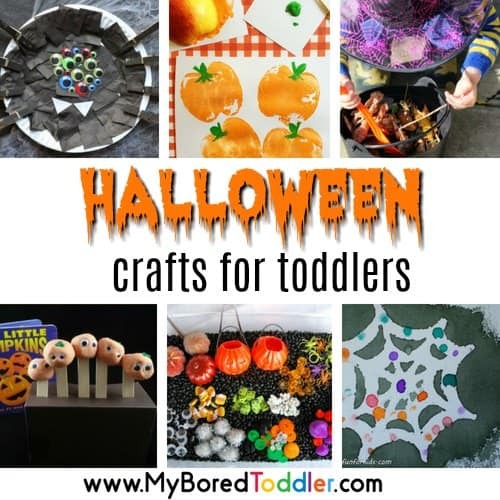 If you make any of these we would love to see them shared in our Facebook group or tag @myboredtoddler on Instagram and I’ll pick my favorites to repost! 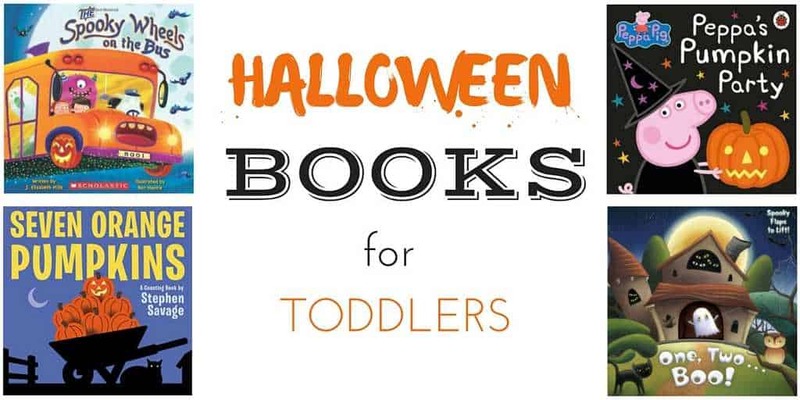 Make sure you also check out our Halloween Costume Ideas for Toddlers, and Best Toddler Halloween Books. If you want to keep your toddler busy makes sure you share your finished products in our Facebook Group. You can also subscribe to our weekly newsletter and follow us on Facebook, Twitter and Pinterest. Love these ideas! (Wish I had thought of some of them myself!) How much fun to make a witches brew! I’m definitely making that one! Hey there! Stopping by from the Sunday Blog Hop linky on BecauseImCheap.com Thank you so much for linking up! 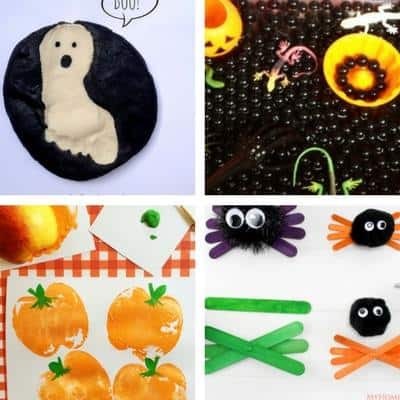 These are such cute Halloween crafts! I’m working on putting together a roundup for Halloween, would you be interested in allowing me to feature one of your projects? 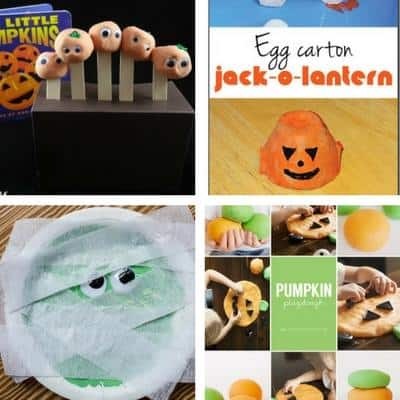 What a great collection of Halloween crafts. Love the thumbprint spiders! Thanks for sharing the collection. Thanks for visiting Marissa. Glad you liked the activities! What a great list! I love the spider with all the eyes! And the spider web activity. Too cute. Thanks for sharing on #ToddlerFunFriday!! The Buzzy Bee Halloween Costume is very neat! Vivid colours and really like a bumble bee! Some great ideas. Will definitely be making some giant spider webs as well as carving a pumpkin . We will do the thumb print spiders. They are definitely preferable to the fingerprints that appear all over mirrors and windows at the moment. We are also going to make cupcakes and decorate them to look like pumpkin jack o lanterns. Bring on the orange food colouring! 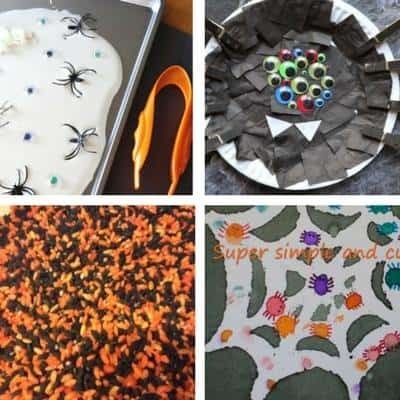 These craft activities all look wonderful! The halloween spider sure looks like a fun little project. Pumpkin carving in the morning, then a traditional Halloween Party at night with bobbing for apples and pin the Limb on the Zombie for party games! Taking my son trick or treating for the first time! Some pumpkin carving & watch a (fairly) scary film! I am having my annual HorroMovieThon, in which we watch horror movies from the ’20’s to the ’15 all month long. Followed by real ghost and paranormal videos, and stories. Love the ideas; our kids love craft! Very relevant. The kids costumes look like Fun! Easy how to instructions are a bonus! We will be in a Lakeland, Fl campground. We have no plans unless the campground has trick-treating. Absolutely love all the craft ideas! We are off to our first ever Halloween party this year, with dressing up, trick or treating & lots of Halloween party food. Mr 3 is super excited and thinks it should be Halloween every day. At this stage we aren’t doing anything for Halloween except handing out lollies to trick-or-treaters! We’ll be dressing my stepdaughter up as a monster high girl and going to a party! Wow what great ideas! Kids r going to love making these! We would be attending a Halloween party and I’m now baking lots of Halloween cookies for the occasion. Another great website I otherwise would have missed. Good luck to all who enter the comp! Love all the ideas! It’s so hard sometimes to think of new things! Loving all the sensory craft/ activities!! Thanks Sara, glad you like them! What great ideas. My kids are all grown up and I live alone, so I will be only handing out candy. This Halloween the kids and i will have some fun, making our costumes while it still light, just in case we get a fright! 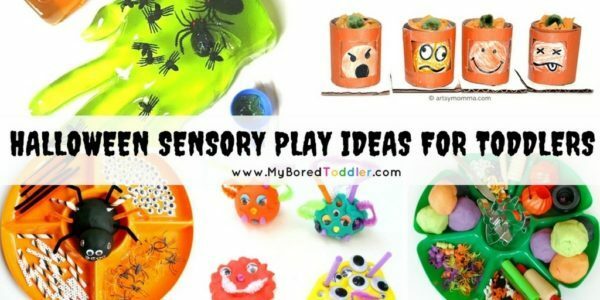 I love the sensory ideas! One year I did a halloween party and one thing I did was filled a rubber glove with water and floated it in the punch in a punch bowl! That sounds like lots of fun.. I might have to try that one! Can’t wait to try the sensory bins! We’ll be at a campground in Lakeland, FL attending a business meeting. Thumbprint Spiders – great idea! Will get me some to help celebrate Halloween with my crazy girlfriends. While I don’t like Halloween as a holiday – the egg-carton jack-o-lanterns are so cute! I might use this to create a whole “family” of egg carton creatures/people. Glad you like them Lara! Ninja turtle jack o’lanterns! COWABUNGA! I WANT to be the black swan and my little sister a bossy queen…I LOVE Halloween! Hi! We’ll be baking some spooky cookies and trick or treating for the very first time in a big group with the other neighbourhood kids. I can’t wait! Love this website to bits! Wow lots of great ideas here! I am taking the children trick or treating, followed by a friends birthday party. I will be dressing up as a Vampire this year. Will be lots of fun! wow lots of cool ideas and kids LOVE being creative! The fingerprint spiders are very cute and quirky. Perfect for a hippie Halloween! Going to a park dressed up. Have a treasure hunt there. Then visit gran who has a carved pumpkin. I’m not the door knocking mum with kids, just not me. But we have an alternative. A fun day in the end. My eight year old daughter has made a Halloween friendship bracelet bowl. Scary bowl filled with bracelets to hand out to the truck or treat visitors (and a likely too)! I can’t wait to take my little one trick or treating! I think I’m more excited than he. Love that they really are easy crafts that you can do with littles! Thanks Kate. That’s the idea! Hubbys working so a scary night in with the kids watching scooby doo!